Ghanaian highlife music band for hire. Boombaya offer a fresh and contemporary approach to highlife, which retains its soul and swing, but also adds jazz and urban music nuances. There are few well versed in Ghanaian highlife music who are not familiar with the guitar rhythms of Alfred Kari Bannerman. Over the course of two decades, he has become Ghana’s most renowned guitarist. 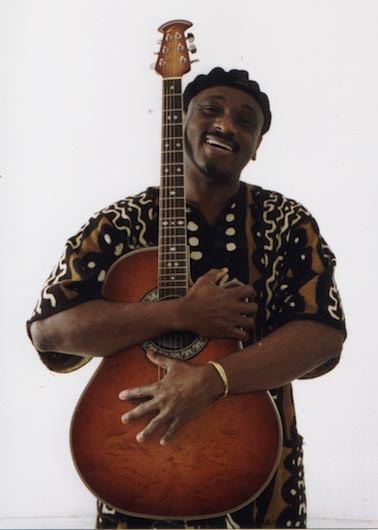 Kari’s credits include recording and touring with Osibisa, and with some of West Africa’s most celebrated highlife artists – from legends E.T. Mensah and S.E Rogie to contemporaries like Kojo Antwi and Bunny Mack. On the Jazz & Blues circuit also, his talents have received considerable recognition and he has performed with Ronnie Laws, Hugh Masekela and Peter Green of Fleetwood Mac fame. Now with his own band Boombaya his musical influences converge to create an exciting blend that offers a fresh and contemporary approach to highlife, which retains its soul and swing, but also adds jazz and urban music nuances.